Concept of frequent occurrence in the utterances of the Prophets, and closely interwoven in their peculiar construction of Israel's history and destiny. The idea is indicated in the name of Isaiah's son Shear-jashub (Isa. vii. 3). Israel, steeped in sin and disloyal to Yhwh, will be severely chastised. The hostile nations, indeed, are the executioners of a deep, divine plan (comp. Isa. x. 5). Many, even the greater part, of Israel will fall or be carried away. The remnant will be saved and will return (Isa. x. 20, 21). In Isaiah's faith the impregnability of Jerusalem and the indestructibility of Israel are unshakable and fundamental elements. His doctrine of the remnant is, in the main, centered in them (Isa. x. 22, where the better reading would be ; for if, or since, "Yhwh is with thee, O Israel," as the sand by the sea will be Shear-jashub, the remnant that will repent and be saved). This remnant will no longer rely upon alliances with the surrounding nations, but upon Yhwh (Isa. x. 20). The process by which this remnant is separated is likened to the gathering of grapes or the shaking of an olive-tree, the result being that some of the fruit is left. But though those who survive will be few in number, they shall be "called holy" (Isa. iv. 3, xvii. 6). Isaiah's contemporary Micah (if the passages really belong to him; they have the appearance of being the utterances of later apocalyptic seers) proclaims the same doctrine. Exiled Israel will still have a remnant free to influence, for good or evil, its surroundings; and this remnant will be gathered again (Micah ii. 12, v. 6, 7). Zephaniah (during the reign of Josiah) apparently identifies this remnant with the "meek" of the land. It has found a refuge and means of escape on the great and terrible day of judgment, and to it is promised the rulership of the Philistine coast-districts (Zeph. ii. 3, 7). This remnant "of the house of Judah" will be visited by Yhwh, and their captivity will return. This "remnant of Yhwh's people" will also despoil discomfited Ammon and Moab. In Zeph. ii. 9 this "she'erit" interchanges with "yeter goy" in the second half. In the third chapter of Zephaniah, which, however, bears every indication of being post-exilic, the remnant of Israel, "a poor and needy people" (Hebr. ), is described as not committing iniquity, as speaking only the truth, and as living in blissful pastoral peace and security. Jeremiah makes most elaborate use of the theory. The prophet foresees that Judah is doomed to captivity; but he is equally certain that a remnant will survive. This remnant will have to endure much. It will be gleaned as thoroughly as a vine (Jer. vi. 9). It is described as "the remnant of my flock," and is promised restoration and increase (Jer. xxiii. 3). This remnant is the subject of a most fervent, but jubilant, prayer for succor (Jer. xxxi. 7). The remnant is the people of God (ib.). Jeremiah employs the phrase also in the sense of "those that escaped deportation" (Jer. xlii. 15, 19). Ezekiel is moved by the signs of destruction to ask whether "the remnant" of Israel will not be spared (Ezek. ix. 8. xi. 13). The context shows that for Ezekiel the phrase has the value of a technical term connoting the congregation of Israel, the exiles; and in Haggai it has the same force, denoting the common people, the congregation, as distinct from the princes and priests (Hag. i. 12, ii. 2). This congregation, or remnant, of Israel, according to the critical school, is identical with the loyal Ḥasidim (the "meek," the "poor") so often referred to in the Psalms, the martyrs during the Maccabean rebellion, the "servants of Yhwh," who, when the Maccabean princes proved false, remained true to their God. 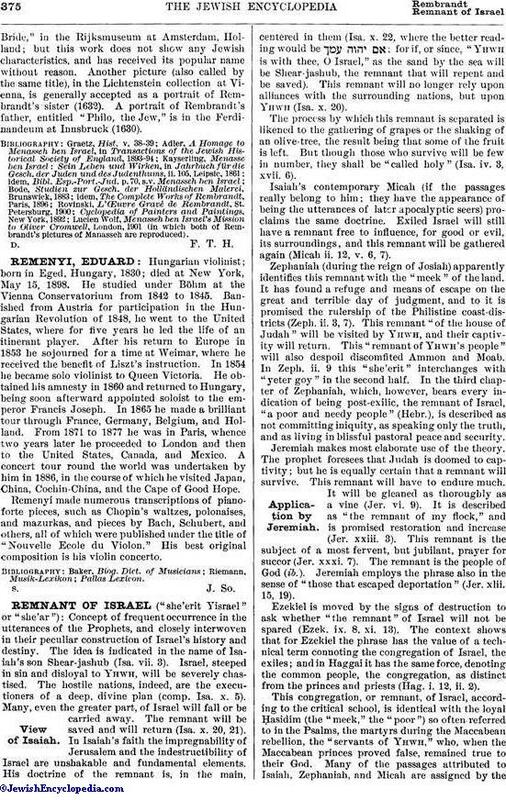 Many of the passages attributed to Isaiah, Zephaniah, and Micah are assigned by thecritics to unknown writers of post-exilic and Maccabean times (comp. 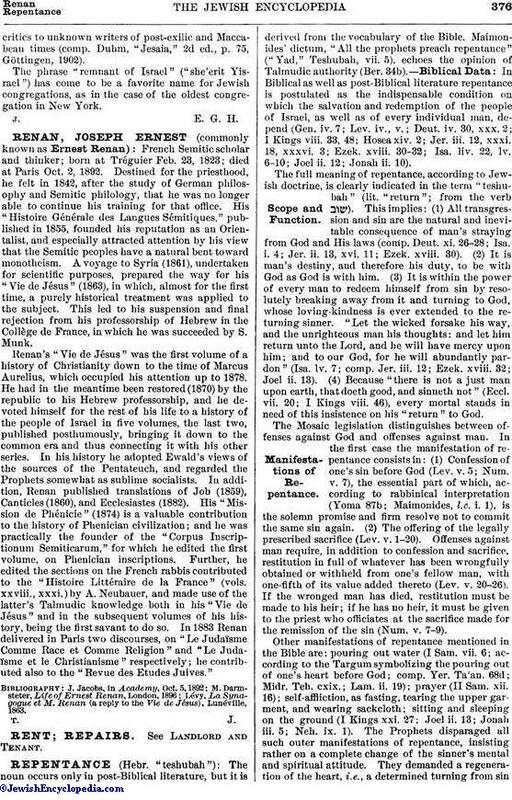 Duhm, "Jesaia," 2d ed., p. 75, Göttingen, 1902). The phrase "remnant of Israel" ("she'erit Yisrael") has come to be a favorite name for Jewish congregations, as in the case of the oldest congregation in New York.